I love that this candle gives you the option of being able to mix and match the wax beads to create your own scent. However, I wasn't thrilled that mine smelled like soap. The scent doesn't go far either. The price is good and the burn time and size are decent for the price. Because of this, I'll get more of these, but this candle is nothing to rave about. A candle that if you buy more than one...can be used to mix and match for a custom scent! This candle is unique in that it actually is not solid wax. Inside the jar, the candle is actually tiny granulated pieces of wax that can actually be dumped out if you are not careful. As the candle burns the tiny pieces melt and will harden to form a solid "sheet" over the granules. If you burn the candle for at least an hour, this will happen the first time around and you won't have to worry about any of the granules escaping the jar. After it is burned a bit and solidified again, the wax feels very nice. It doesn't even leave a waxy residue on your fingers like cheap quality candles might do. The cool part is that if you buy more than one scent, you can mix and match the beads of wax to customize your own unique scent. So grab a few and bowl to mix the granules and then pour back into a candle jar to experience your creation. This candle has four choices for fragrance: french vanilla, champagne rain, midnight romance, and apples & cinnamon. I chose the midnight romance which is ironic because I hate choosing flavors or scents when the name does not really indicate what the actual fragrance is. The midnight romance smells like a rose hand soap. It kind of has a grandma feel to it, but doesn't smell bad. It just isn't something I found myself sticking my nose in to smell on purpose. It also does not dissipate very well. Because of me not raving about the smell, this didn't bother me much. You really can't smell the candle if you are more than a foot or two away. I left my apartment to get the mail and when I came back after smelling fresh air, I couldn't detect the candle in my apartment either. Normally, this would be really disappointing to me. Smell aside, this candle does burn nicely and looks pretty in its glass jar. The light blue color of the midnight romance also looks pretty when lit. The wick is a decent length and should be trimmed 1/4" before being lit. The candle should also not be lit for more than 3-4 hours at a time and cooled completely before relighting. The first time I burned this candle, I did it for about 3 hours. It burned evenly the first time and went down less than I expected. Eden says the burn time on this candle is 12 hours, but I would estimate that it is a bit more than this, perhaps 15-18 hours. I say this because I have now burned it for a total of 6 hours and it is no where near half gone. It has not continued to burn evenly however. It has now shifted more to one side. I love candles that have a top for when I want to put out the candle. This one has that. It comes in a small clear glass jar that is a little less than 3" tall and 2 1/2" wide (4 ounces). Through the clear glass you can see the granules of wax. 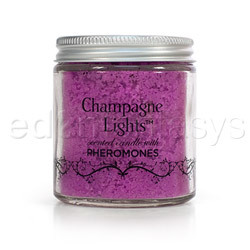 On the front it says the name of the candle and that it is scented with pheromones. There is a cute design of a vine that goes all the way around the base of the candle. The back has instructions for burning. The top of the jar is tin and screws on which is nice after you blow the candle out. It keeps the smoke in the jar instead of in your living space. Be careful when handling the jar though. The glass can get really hot! This candle claims to be scented with pheromones, but like I stated I didn't notice an increase in arousal or sexual energy at all. How knows? Maybe it is because I could not really smell it. I am giving this candle 3 stars. It is a good size, but smells only ok and doesn't fill a room. The burn time is good for a candle of this price though. It is really cool that you can mix and match the granules which is an added reason that I plan to buy more of these, I just wouldn't rave about them. I enjoyed this while I had it, but after it burned down to the bottom, I have decided that it actually was not worth the money. It is cute to add to gifts, but I can easily go out and get a candle for the same amount but three times the size at a Walmart or Target. The last half of the candle seemed to burn much quicker than the first half and it was gone before I knew it. I totally have, but not from here. Woodwick is a great brand. Thanks for the review! Didn't know what 'Midnight Romance' was, thanks for the description!